You are viewing articles tagged parking. 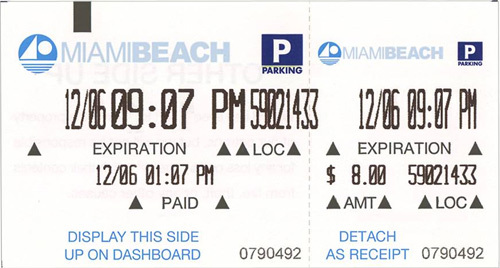 Miami Beach Parking Receipt Generator. Supposedly they’re on to this, so it’s just for fun. (via) Update: MBPRG got p0wned. Miami-Dade commissioners are cooking up a plan for Carnival Center parking. I don’t understand why it’s this difficult to figure out parking for a building that’s essentially surrounded on all four sides by parking lots ready to be built up into garages. Also, examination of the report (.pdf) reveals what a very paper-based and old-school administrative system is our county government. Tremont and Beach Towing (via) share the wealth. 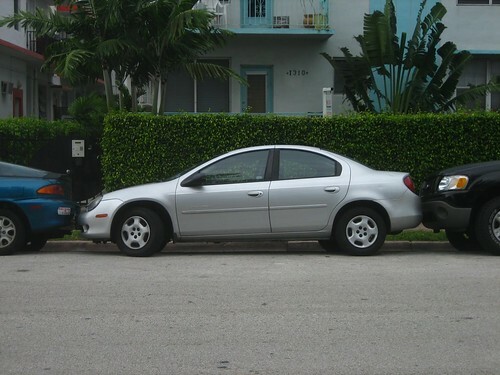 One time I parked in the alley behind my building to unload my groceries, and when I got back from dropping the first haul my car was on the truck. Cost me $125 just for him to put it down; he didn’t tow it a foot. On the other hand, Beach residents feel a little differently about these guys then anyone else, because without them we’d never be able to park. A parking garage right here? Well, duh. Boxed in. How many times do I have to point out that we’re all in this together, and if we don’t look out for each other, we’re lost? 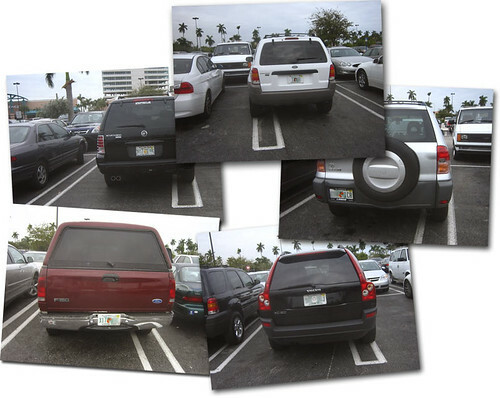 Equally bad: people who park and leave big spaces behind and in front of their car, where a second car could have fit if they’d just scooted forward. People like this deserve unpleasant notes left under their windshield wipers. Parking at Miami Performing Arts Center has a PL4n! Then I straightened out the route and compared it to the legend. As sketched, it’s 2,496 feet, or just shy of a half mile. No big deal on a nice day, but try it dressed up on a muggy October Miami evening. I actually suggest the valet, which at $20 is only $5 more then the spot in the garage; standing around in the hot air is preferable to schleping a half mile. By the way, Here’s a link to MPAC’s flash-based parking widget. Personally, it doesn’t quite work in IE or Firefox for me, but others may have better luck. Swallows the “three blocks” crap hook, line, and sinker—right out of the gate (metaphor whiplash, sorry). “a sell-out crowd at the center, which has a capacity of 4,820” Let’s not bother to point out that that means 1.97 seats for every parking space. “Center leaders acknowledged the need for nearby parking garages more than 10 years ago while planning the state-of-the-art center, which is $102.1 million over budget at $446.3 million.” Good enough, though the original budget was $255 million, which puts the current total more like $191 million over budget. “Though the center will miss the opportunity to profit from parking fees from its own garages, Hardy said the new plan won’t burden the budget, either.” I guess you can’t “LOL”s in a newspaper article, so we’ll let this one go. “The Performing Arts Center is likely to be completed in early August.” Wrong. Update: Another Herald article offers a dry look at MPAC prices.